Lhasa is a city of roughly 255,000 people and is at an altitude of approximately 3,650 metres (11,975 feet). Lhasa has a been an important religious center for Tibetans for over a thousand years. The city was not made into the political center of Tibet until the fifth Dalai Lama conquered Tibet in the 17th century. From that point on Lhasa became the political and spiritual center of the world for Tibetans. Today, Lhasa is the capital of the Tibetan Autonomous Region, as well as its largest city. Norbulingka Palace was the summer palace of the Dalai Lama. The Potala Palace used to be the winter palace of the Dalai Lamas, that ruled Tibet, until 1959, when the 14th Dalai Lama fled to India. Construction at the sight started in 637, but the modern Palace was build by the Fifth Dalai Lama, who started its construction in 1645, after one of his spiritual advisers, Konchog Chophel, pointed out that the site was ideal as a seat of government. As it is situated between the Drepung and Sera monasteries and the old city of Lhasa. The palace rises more than 300 meters above the valley, and consists of many parts, including the White and the Red Palace, many Chapels, and the Tomb of the Thirteenth Dalai Lama. At the moment the palace serves as a museum. If you want to visit be aware that the number of visitors that can visit is limited. It is also on the UNESCO World Heritage List. Barkhor is a large market that follows the kora (pilgrim circuit) around the Jokhang temple. The market continues down many of the side streets. Sera is a large monastery university located 7 kilometres from the city centre of Lhasa. Jokhang is the spiritual center of Tibet Buddhism. Namtso Lake is a stunning high altitude holy salt water lake a few hours north of Lhasa. Tibetan New Year (Losar) is celebrated every year sometime between late January and late February. Losar can be very colorful in Lhasa as many nomads take a pilgrimage to the city during losar. Lhasa has four distinct seasons. In the winter it is cold with the occasional heavy snowstorms. From December to February the average daytime temperatures are between 7 and 9 °C while nights average around -10 °C. During the spring it can be quite cold and wet with nights still around zero and days of 12 to 15 °C. The summer is the monsoon season and has frequent thunderstorms. Temperatures from June to September are mostly between 20 and 25 °C while nights are mostly around 9 °C. The fall can be nice but winter always comes early and nights in October are already just around zero. Average annual precipitation is just around 400mm of which over 50% falls during July (the wettest month at 122mm) and August. Lhasa Gonggar Airport (LXA) is located about 90 minutes west of town and served by regular buses that leave just in front of the CAAC office, where you can purchase air tickets, just east and north of the Potala Palace just off of Beijing Lu. The Lhasa airport has regular flights to Beijing, Shanghai Pudong International Airport, Chengdu, Xi'an, Qamdo, and Chongqing. There are also international flights to Nepal. The Qinghai-Tibet Railway is one of the newest train services in the world, officially inaugurated on the 1st of July, 2006 with the opening of the last leg from Golmud. Officially called the Qingzang Railway, it travels from Xining in Qinghai province, China, to Lhasa. There are, however, other cities in China, where you can get on the train and travel directly to the Tibetan capital, including all the way from Beijing, Shanghai, Chengdu and even Guangzhou. From Golmud, it's 1,142 kilometre, from Xining about 1,950 kilometres. The line includes the Tanggula Pass, which, at 5,072 metres above sea level, is the world's highest rail track. The 1,338-metre-long Fenghuoshan tunnel is the highest rail tunnel in the world at 4,905 metres above sea level. Over 80% of the Golmud-Lhasa train is at an altitude of more than 4,000 metres and there are oxygen supplies are available for each passsenger in the train, hopefully preventing altitude sickness. It is expected that new lines and branches will open, connecting Lhasa with other places like Nyinchi, Shigatse and Xigaze and even on to the border with Nepal. Some of the constructions have begun already and most of them will be completed before 2020. Rumors about extensions towards India and other Asian countries are not more than rumors! The Lhasa train station is just outside of town but you can buy tickets from offices in the city. Buying tickets in the high season can be very difficult. There are trains to Beijing, Shanghai, Chengdu, Xi'an, Xining, Lanzhou and Golmud (Qinghai). The long distance bus station is located in the southwest section of the city at the intersection of Jinzhu Xilu and Minzu Lu. There are many daily buses to Golmud (Qinghai), 24 to 30 hours. Cycle rickshaws are everywhere, though be prepared to bargain. Taxis cost ¥10 for anywhere in Lhasa city. Hail them from the side of the street. Be prepared for taxi-sharing - the driver will often pull over if he suspects he can find other passengers heading in the same direction. Each will pay ¥10 and this is a way for the driver to make a better income despite the standard fare. Public buses are numerous and cost ¥1. Non-Chinese nationals are permitted to travel on the buses within the city, although you make yourself an attraction by doing so, since this rarely occurs. The number of the bus is recognizable but the destination is in Chinese, so you need to know which bus line you need. Minibuses operate to areas such as Norbulingka, Sera Monastery, Drepung Monastery, and other nearby sites. Most of these are also on public bus lines. "Pilgrim buses" are available in front of Jokhang Temple or at the parking lot near the temple, departing at 6-7AM for destinations outside Lhasa, such as Tsurphu Gompa, Ganden Gompa, Nyemo (Dazi), Phenpo Lhundrub (Linzhou), Meldro Gungkar (Mozhugongka), Chushul (Qushui), Taktse (Dazi), Gongkar (Gongga), and other nearby areas. Tickets are available at the ticket office at the parking lot or when you board the bus. Whether or not non-Chinese nationals can travel on these is a bit of a grey area. Since you have to have a travel guide with you anyway as a non-Chinese tourist, you can ask them to enquire about this, since it is a more interesting way to travel than always in a private Land Cruiser. However, the rules for organising tourist tours require advance planning, so you probably won't have this chance. Walking Beijing Lu is the main east west street in the city and easy to walk on. Bicycle hire is available from some hotels or cycle shops and it's a good way to explore if you have half a day free on your tour schedule. Pollution is not as bad as in many Chinese cities but driving habits are. The best tactic is to stick close to a local cyclist or cycle rickshaw when negotiating busy junctions. There are several Chinese and western restaurant located around Beijing lu and the Jokhang. Every night at the intersection of Mentsikhang lu and Beijing lu BBQ vendors set up shop selling tasty meats and veggies. Walking west east on Beijing Lu there are several western style bars and cafes. Ask hotel and guest house owners about local Tibetan discos which can be fun. Snowlands Hotel is a standard budget hotel with basic dorms and doubles. Snowlands is located on Mentsikhang Lu in the direction of the Jokhang. This is the hotel most people are booked into for their first few nights if on a budget tour. There is also a good travel agency located in the hotel on the second floor. Yak Hotel is located on Beijing Donglu near the Jokhang and is a great budget hotel with good dorms and very nice double rooms. There is also a nice western restaurant located right next door. The only downside is there are no reservations for dorm rooms. Oh Dan Guesthouse is a small hotel located at No 15 Ramoche Lu. Lhasa Hotel is located at 1 People Road and is a little outside the city. This is the nicest hotel in the city and was the former Holiday Inn before the chain decided to move on. Tibet University offers semester and year long classes on Tibetan Language, music and culture. 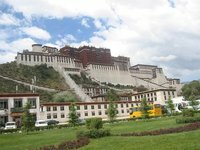 We have a comprehensive list of accommodation in Lhasa searchable right here on Travellerspoint. You can use our map to quickly compare budget, mid-range or top of the range accommodation in Lhasa and areas nearby. This is version 40. Last edited at 3:10 on Aug 2, 17 by sleepBot. 27 articles link to this page.